Mountain Bike racing is super competitive and tough on equipment, especially wheels & tires. Everyone’s looking to shave fractions of a second off their race time which means keeping momentum at a high level over the roughest terrain like rock gardens, tree roots, scary steep terrain and huge jumps. Today’s world of wheel & tire set-up is wide rims, wide tires, tubeless (TLR) and lowest tire pressure possible. With this set up, the biggest issues are rim damage, burping air out of the tire and tire sidewall roll over. And if you lose enough air in the tire, it can come off the rim and now you are pushing your bicycle instead of riding it. Results are based on ongoing testing with professional riders, weekend riders, biking enthusiasts and 3rd party independent laboratories. Flat Tire Defender® is designed to use with air pressure in the tire. If air pressure is lost during a ride which is typically from improper installation, tire bead damage, incorrect tire for terrain, tread puncture, sidewall cut, rim damage and/or incorrect tire pressure, the load is put solely on the foam inserts. Although Flat Tire Defender® is made of ‘High Density’ foam material and provides an impact resistance ‘Bump Stop’ protection layer between the tire sidewall and rim edge, which has proven to minimize sidewall cuts, pinch flats and rim damage, there is no such thing as bomb proof set up when it comes to tires/rims/wheels. Whether you’re a serious racer or weekend trail rider on a Downhill bike, Enduro bike, Plus bike or eBike, don’t let a flat tire ruin your day! 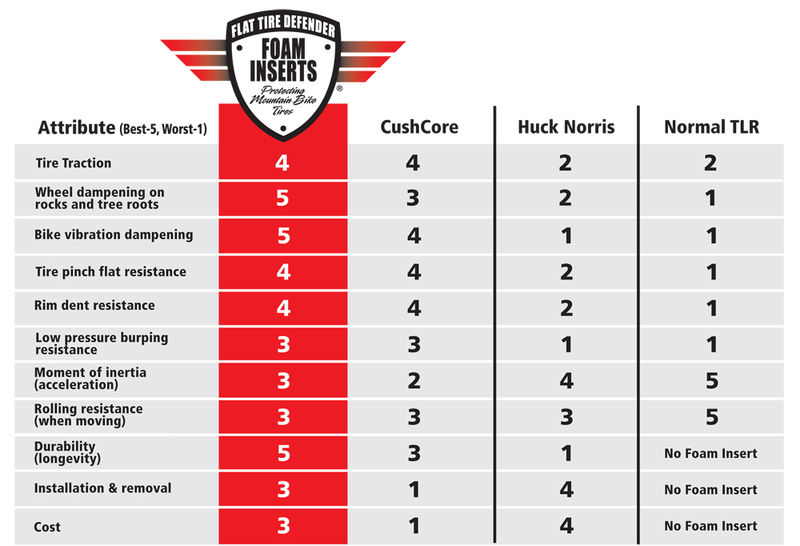 Introducing Flat Tire Defender® – Foam Inserts! How do you like our product? Please fill out our CONTACT FORM and let us know how we’re doing.